2015 Software 500. eBusiness, security, and healthcare sectors dominate the software industry.. The total software and software services revenue for the 2015 Software 500 totalled $748.7 billion, up 4.3 percent from $717.7 billion, according to the findings of the 2015 Software 500 ranking of the world’s largest software and services companies. In its 33rd year, the Software 500 provides a look at changes in the software industry from a revenue, employee, and research and development (R&D) perspective. The 2015 Software 500 is based on each company’s 2014 fiscal year reports, which we observe as fiscal year periods that end between March 31, 2014 through February 28, 2015. With insights derived from the extensive survey’s results, we determine that eBusiness applications, security tools/systems, and healthcare are top growth areas, with these categories reporting more than 700, 600, and 500 percent growth, respectively. In addition to revenue and growth, the state of employee staffing indicates the health of each business category as well as the overall software industry. The total number of employees reported in the 2015 Software 500 is 5,572,404, indicating a double-digit growth of 14 percent from last year’s 4,884,000. The top 10 ranked companies saw some changes, but No.’s one through seven remained the same. Taking these top spots are IBM, Microsoft, Oracle, Accenture, HP, EMC, and SAP. Apple and Ericsson switched for the No. 8 and No. 9 slots, with Ericsson declining one and Apple moving up. Capgemini moved into No. 10, beating out NTT for its top 10 position, with NTT dropping down to No. 14. Apple saw the most growth by far in the top 10, reaching $18.06 billion for a growth of 13 percent. The second highest growth in the top 10 comes from EMC at five percent, reaching $24.44 billion. IBM continues to be the top employer in the Software 500, but reports a reduced head count of 412,775, down from 463,785 the previous year. Second again this year is Hitachi, reporting a head count of 320,725, which is down slightly from the previous year’s 326,240. The average R&D investment for the entire 2015 Software 500 is 12.4 percent, down from last year’s average of 13.4. It is worth noting that this decrease comes after an increase from 2013 to 2014 Software 500 rankings. The number one growth leader in companies with software and services revenues over $1 billion is Tech Mahindra Limited, ranking No. 48 with growth of 149 percent in the measurement year. The company describes itself as a representative of the connected world, offering consulting, digital transformation, integrated engineering, and business services and solutions for enterprises. Tech Mahindra provides services, platforms, products, solutions, and reusable assets that connect across a number of technologies to deliver tangible business value to its stakeholders. The company operates in key industries that drive economic growth, including tractors, utility vehicles, IT, financial services, and vacation ownership. The second growth leader is Nuance Communications, ranking No. 71, with an 88 percent growth over last year. Nuance distributes its products through a network of channel partners including leading system vendors, ISVs, value-added resellers and distributors, and direct sales. Part of the company’s success is attributed to its relationship with leading technology companies such as Accenture, Avaya, Canon, Cisco, Hewlett-Packard, IBM, Lexmark, Microsoft, Nortel, Sony, and Xerox. Its customers span a range of industries and disciplines with particular concentration in areas such as financial services, healthcare, government, educations, utilities, travel, and telecommunications. Nuance product lines focus on speech, dictation, and imaging. Also notable among companies with more than $1 billion in revenue is Constellation Software Inc., No. 82, with 41 percent software and services growth over the previous reporting year to reach $1.53 billion. The company provides software and services to a select group of public and private sector markets. It acquires, manages, and builds industry-specific software businesses that provide specialized, mission-critical software solutions that address the particular needs of its customers. The number one growth leader in companies with software and service revenues between $100 million and $1 billion is FireEye Inc., No. 213, reporting 238 percent growth from the previous reporting year. The company provides a virtual machine-based security platform designed to offer real-time threat protection to enterprises and governments worldwide by thwarting cyber attacks that circumvent traditional signature-based defenses such as firewalls, IPS, anti-virus, and gateways. According to the company, it services more than 3,700 customers across 67 countries, including 675 of the Forbes Global 2000. Second in the category is TubeMongul Inc., No. 283, showing nearly 100 percent growth from the previous reporting year. The public enterprise software company targets brand advertising needs. Its self-service platform enables advertisers to gain greater control of global advertising spend and achieve brand advertising objectives. Also notable is Speed Commerce Inc., No. 288, with a 96 percent growth over the previous reporting year, reaching $107 million in revenue. The single-source provider of ecommerce technology and services helps retailers and manufacturers acquire new customers by providing personalized, relevant experiences. The company recently launched a new marketing campaign that centers on its vision of becoming one of the largest full-service players in the ecommerce industry. For a further breakdown of top growth companies with over $1 billion and $100M, see the Growth Chart, Keeping Fast Company I: Growth in Revenue Above $100M. Topping growth for companies reporting between $50 and $100 million in revenue is Xero Inc., No. 353. The company shows 86 percent growth over the previous year, reaching $54.57 million. Xero provides online accounting solutions to more than 500,000 customers in over 180 countries. Targeting small businesses, the company enables its users to save time on back-office processes to enable a focus on higher value, higher impact services. Second in this category is InterCloud Systems Inc., No. 354, reporting $54.27 in revenue with a growth of more than 63 percent from the previous year. The company is a single-source provider of end-to-end IT and network solutions, including Software Defined Networking and Network Function Virtualization to the service provider and corporate enterprise markets. Through its cloud solutions and professional services, the company assists customers in meeting evolving technology demands. Upland Software Inc., No. 335, comes in at number three in the $50 to $100 million category with more than 56 percent growth and a total software and services revenue of $64.57 million. The company provides cloud-based enterprise work management software, designed to connect people through technology, automate workflow, and bring visibility. Reporting top growth in companies between $30 and $50 million is Unwired Planet Inc., No. 380. The company reports a revenue of $36.40 million, compared to only $121,000 in the previous year—a whopping growth of 29,979 percent. The company describes itself as the inventor of the mobile Internet and an intellectual property company focused exclusively on the mobile industry. Its patent portfolio of more than 2,500 issued and pending U.S. and foreign patents includes technologies that allow mobile devices to connect to the Internet and enable mobile communication, spanning 2G, 3G, and 4G technologies, as well as cloud-based mobile technologies. Second in growth for this category is Castlight Health Inc., No. 367. Showing 252 percent growth from the previous year, the company reports revenue of $45.61 in the 2015 Software 500. The enterprise healthcare management company provides the Castlight Enterprise Healthcare Cloud, which enables employers to understand and manage healthcare investments while helping employees make the best healthcare decisions. Attunity Ltd., No. 383, comes in at number three for growth among 2015 Software 500 companies reporting between $30 and $50 million, reporting 41 percent growth over the previous reporting year. The company provides information availability software solutions that enable access, management, sharing, and distribution of data across enterprise heterogeneous enterprise platforms, organizations, and the cloud. Its software solutions include data replication, data flow management, test data management, change data capture, data connectivity, enterprise file replication, managed file transfer, data warehouse automation, data usage analytics, and cloud data delivery. For a further breakdown of top growth companies between $30 and $50 million, see the Growth Chart, Keeping Fast Company II: Growth in Revenue $30 – $50M. Among companies with $10 to $30 million in revenue, the growth leader is Aerohive Networks Inc., No. 435. With 75 percent growth over the previous year, Aerohive is an enterprise mobility company that enables enterprises to leverage mobility to increase productivity, engage customers, and grow business. The company’s mobility platform utilizes the cloud and a distributed, controller-free architecture to deliver unified, simplified networks. Second in growth within the category is TIE Holding NV, No. 406. The company, which goes under the name of TIE Kinetix, develops cloud- and license-based solutions. The company says it transforms the digital supply chain for its customers by providing total integrated ecommerce solutions to maximize revenue opportunities by minimizing the energy needed to market, sell, deliver, and analyze online. Third in growth for this category is WSO2 Inc., No. 434, a company that offers an integrated enterprise platform that enables businesses to build, integrate, and manage APIs, applications, and Web services on premises, in the cloud, as well as on mobile devices. Of companies in the 2015 Software 500 reporting under $10 million in software and services revenue, Pacific WebWorks Inc., No. 480, shows the highest growth in the category at 295 percent. The company provides a suite of software programs for small businesses that want to create, manage, and maintain an effective Web strategy including full ecommerce capabilities. Pacific WebWorks operates a number of wholly owned subsidiaries including IntelliPay, its internet gateway, TradeWorks Marketing, and Headlamp Ventures. The second highest growth in this category comes from Ultrasis UK LTD, No. 498, a provider of technology-driven healthcare solutions. The company develops and delivers evidence-based health and social care through its products and services, utilizing a blended approach of people and technology to improve access to affordable healthcare. Third for growth in the under $10 million category is BIO-key International Inc., No. 492. The company develops and delivers advanced identification solutions to commercial and government enterprises, integrators, and custom application developers. It provides biometric finger identification technology used to identify and authenticate users of wireless and enterprise applications. Its solutions are used in local embedded OEM products as well as large identification deployments. For a further breakdown of top growth companies between $10 and $30 million, see the Growth Chart, Keeping Fast Company III: Growth in Revenue $10 – $30M. The eBusiness Applications business sector saw an employee growth rate of 54 percent compared to last year, with 26 firms totaling 13,476 employees. The overall revenue for the business category is $2.7 billion with an average growth of 30 percent and overall segment growth of 770 percent. Top growth performers in the eBusiness Applications business category are familiar from the previously detailed Growth Charts, with Pacific WebWorks Inc. coming in with the highest growth, followed by Speed Commerce Inc., and Xero. Other noteworthy companies in this sector include VeriSign, No. 103; PFSweb Inc., No. 227; and Bazaarvoice Inc., No. 242, touting the top revenue of the sector, respectively. VeriSign provides domain names and Internet security solutions to ensure the security, stability, and resiliency of key Internet infrastructure and services. PFSweb Inc. is a global ecommerce solutions provider that combines integrated technologies, professional services, and a logistics infrastructure to deliver unique and branded customer experiences. Bazaarvoice Inc. is a network of active shoppers, connecting more than a half billion consumers to thousands of retailers and brands that represent tens of millions of products and services online, in stores, and on mobile devices. The Security Tools/Systems business sector is a top performer in total revenue growth, with the segment overall showing a growth of 644 percent, or an average of 36 percent. Employee growth is slightly down from last year—0.33 percent, with the company reporting a total of 214,976 total employees this year. There are 35 companies reporting in this sector for 2015. Again, top growth performers in this category are familiar from previously outlined Growth Carts, and include FireEye and BIO-Key International. Number three is Palo Alto Inc., No. 208, which is a cyber-security company with a security platform developed to prevent cyber breaches. Top revenue performers include Symantec Corporation, No. 25; Indra Sistemas S.A., No. 38; and Gemalto NV, No. 45. Symantec Corporation is an information protection expert that helps consumers and organizations secure and manage their information-driven worlds. Based in Spain, Indra Sistemas S.A. is a consulting and technology multinational firm offering business solutions, IT services, and comprehensive systems to clients worldwide. Gemalto is a digital security provider that provides a range of services from advanced cryptographic software embedded in a variety of familiar objects, to highly robust and scalable back-office platforms for authentication, encryption, and digital credential management. The company recently acquired SafeNet. The Healthcare business sector represents strong growth, reporting a total of 581 percent and an average of 51 percent. The sector also saw employee growth, reporting an increase of 14 percent over last year and a total of 115,348 employees among its 22 reporting companies. Top growth performers within the Healthcare sector are Castlight Health Inc. and Ultrasis UK LTD, both of which topped earlier discussed Growth Charts, followed by Veeva Systems Inc., No. 195. Veeva Systems Inc. offers cloud-based software for the global life sciences industry. Top revenue performers in Healthcare include Cerner Corporation, No. 44; McKesson Corporation, No. 46; and IMS Health Holdings Inc., No. 57. Cerner Corporation provides health information technologies that connect people, information, and systems at more than 18,000 facilities worldwide. McKesson Corporation is a healthcare services and information technology company dedicated to making healthcare run better. IMS Health Holdings Inc. is a global information and technology services company that provides end-to-end proprietary applications and configurable solutions that connect 10-plus petabytes of complex healthcare data through the IMS One cloud platform. The Software 500 ranking and corresponding Growth Charts enable us to take a comprehensive look at the overall software industry to identify trends through revenue growth, investments in R&D, and employee growth. In addition to the printed ranking, the Software 500 and its archives are available online 24/7 at softwaremag.com, providing further insight with the ability to compare company statics such as revenue, growth, R&D investment, and employee numbers. This tool is free and simply requires site member registration. 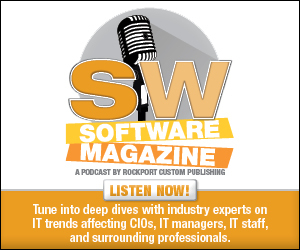 Visit softwaremag.com to access. The financial data of companies that reported annual results in non-U.S. currency were converted to U.S. dollars as follows. A 12-month average of the daily exchange rates for each foreign currency was calculated from historical foreign exchange rate data reported by OANDA Corp. (oanda.com) for the relevant fiscal period. For example, if company ABC reports its financials in Japanese Yen and its fiscal year is April 1, 2013 to March 31, 2014, the daily U.S. dollar/Japanese Yen exchange rates were downloaded for the period and averaged. This average was then used to convert company ABC’s financial information into U.S. dollar figures.